Struggling to find the right office chair for you? Disguised as a standard looking chair, it is anything but! With it’s sleek looks, it includes a secret power weapon against back pain. A revolutionary lumbar support, hidden inside the chair. Most inflatable lumbar supports are sausage shaped. But our lower back curves are most certainly not! This causes a mismatch, and is the reason why you will feel like you constantly need to adjust your chair, or are unable to sit without getting uncomfortable. 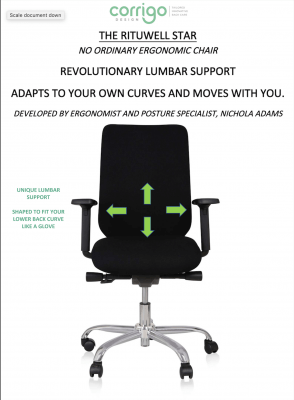 Our lumbar support has been designed to actually fit the shape of your lower back curve. It is shaped to perfectly fit the core part of your lumbar, and is designed to adjust to your own depth of curve, moving with your back as you move. When your back has become sensitised, you need gentle support that hugs your back rather than add to the discomfort. Our unique lumbar support does exactly that. Designed by Nichola Adams, MSc Health Ergonomist, after experiencing a back injury, she knows how essential it is to have a comforting level of support that fits you like a glove.